Van Hire To Spain One Way - How Far In Advance Should You Book Your Spanish Removal? Van hire to Spain one way is a big step � it means you are sure and ready to move to Spain permanently. And that is extremely exciting, scary and a huge change for everyone involved. So you want the move to go as smoothly as possible in order to reduce stress for you and your family. Removals to Spain are unlikely to be a last minute decision since there is so much to organise. 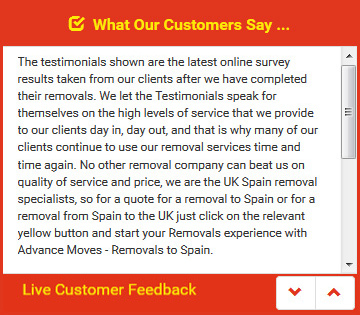 Therefore, when you look at van hire Spain for removals to Spain from the UK, you should consider it well in advance of your actual removal date. Leaving this particular aspect of the move to the last minute is not going to help you remain calm � phoning around trying to find a professional, well-respected removals firm who can move you to Spain with very little notice is going to raise your stress levels hugely. If you do find a removals firm to do the job, then you still won�t be able to relax you will not have had time to ensure that they are as professional as they should be. They may even charge extortionate prices for a last minute job. Therefore, contacting a removals firm to transport your belongings safely and professionally should be done early on in the process. As soon as you know you are definitely moving � even before you have bought or sold any property, you should contact a removals firm for a quote. Once you have a moving date, book immediately. You will have a much smoother move that way. Once you have found your ideal property, come to Advance Moves to organise your van hire to Spain one way. Our specialist team has personal experience in international removals, and you can find a quote on our website (http://www.advancemoves.com/). Contact us on 0871 218 0612 or email info@advancemoves.com for more information.